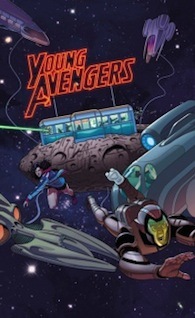 Full disclaimer – I have never read the much-loved original run of Young Avengers from a few years back. It slipped right past me, and I have always intended to pick it up. So without this preconception, I picked up the first arc of Young Avengers a few weeks back, and haven’t looked back. This title is absolutely fantastic, and with issue 7, it looks like its only going to get better. Gillen’s more grounded storytelling transfers over well to the characters. Each individual character acts like you’d imagine a group of 18 year olds battling personal dilemmas like having sense of worth and managing powers. Not only are their issues real, but the dialogue feels real also. These are a bunch of teenagers who react to each other, and the language reflects that – these are kids who are stuck with one another, so it’d make even the most quiet of people want pick on one another. The story in this issue is mainly about having the pieces fall into place. The team is approached by Prodigy, who gives Wiccan information about his brother, who is seemingly absorbed by an inter-dimensional being. As they move to stop him, they find themselves about to pass through other dimensions to do so. There isn’t a great deal going on, but if Young Avengers can be this good on a slow issue, it’s even more brilliant on a better one. Speaking on brilliance, Jamie McKelvie rivals Hawkeye‘s David Aja in art duties and panel design. From his impressive work on his Tumblr-esque recap page, his breakfast menu credits page, or his Facebook photo reel, each page brims with smart design and great art. His character designs, while were initially a bit too realistic for my liking, and felt like a Saturday morning cartoon, have grown on me and I take back all of that. I absolutely adore McKelvie’s work. In fact I adore the entire series. Gillen and McKelvie’s smart design and storytelling have elevated this series to one of Marvel’s best, and one of my favourite series so far. Lets all hope it lasts longer than its predecessor.